Sruthi Palaniappan ’20 leads an Undergraduate Council Town Hall meeting to discuss the future of shopping week with students. Following the cancellation of an Undergraduate Council-led town hall about “Shopping Week,” the UC Education Committee held an “organization meeting” to help students prepare to defend the College’s embattled course registration system in a series of upcoming “listening sessions” with members of a Faculty-led committee. Roughly 50 undergraduates gathered in Harvard Hall Tuesday evening to prepare to strategize a cohesive message to defend Shopping Week — the weeklong period during which students freely wander in and out of courses before officially enrolling — and address undergraduate concerns about its potential elimination. 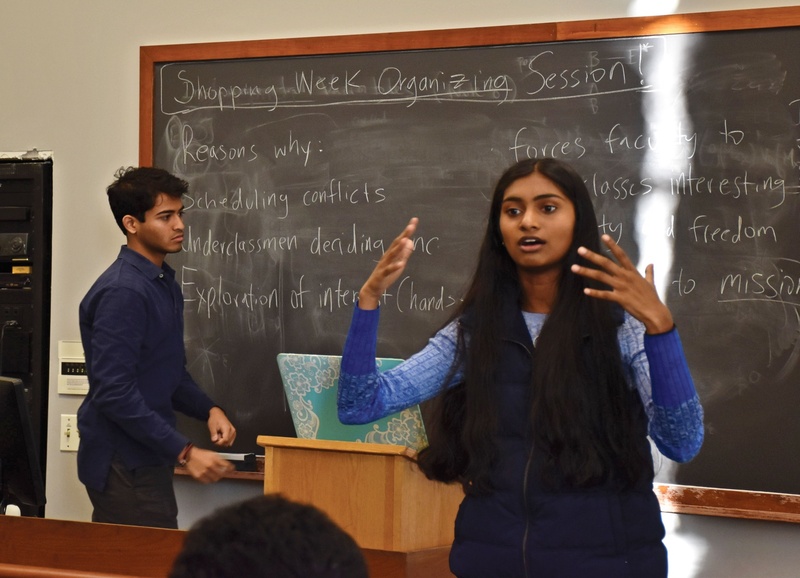 “We thought that it was still important for students to realize that we stand behind them and that we want to be able to build this platform together,” said Sruthi Palaniappan ’20, chair of the Council’s Education Committee. Amanda J. Claybaugh, dean of undergraduate education, announced Monday that, in lieu of the originally planned town hall, the College will hold three separate administrator-led events at which students can share their thoughts on Shopping Week. The events will be attended by members of a recently formed committee tasked with considering alternatives to Shopping Week. Students also acknowledged concerns held by administrators and graduate students, many of whom have bemoaned the uncertainty Shopping Week creates for undergraduate teaching assignments and classroom sizes. “The Education Committee does hope to reach out to graduate students so we can better understand what their concerns are,” Palaniappan said. She added that she thought the conversations about Shopping Week “have been taking place in bubbles” of administrators and faculty, undergraduates, and graduates, with little communication between all parties involved. Several students expressed a desire for undergraduate input to be considered seriously, and not merely as a formality. Cara J. Kupferman ’20, who attended the event, said she “definitely” planned to attend one of the administrator-led listening sessions. Other students expressed a general frustration with the way student input had been considered in the process thus far. Sanika S. Mahajan ’21, a UC Education Committee member, said the current debate was about issues broader than just Shopping Week. “It has to do with the feeling that the student experience at Harvard cannot be something that is just prescribed to us,” she said.